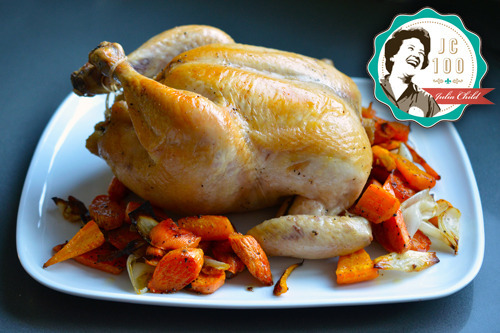 When Julia Child recommends a fool-proof way to roast a chicken, I sit up, shut up, and listen. 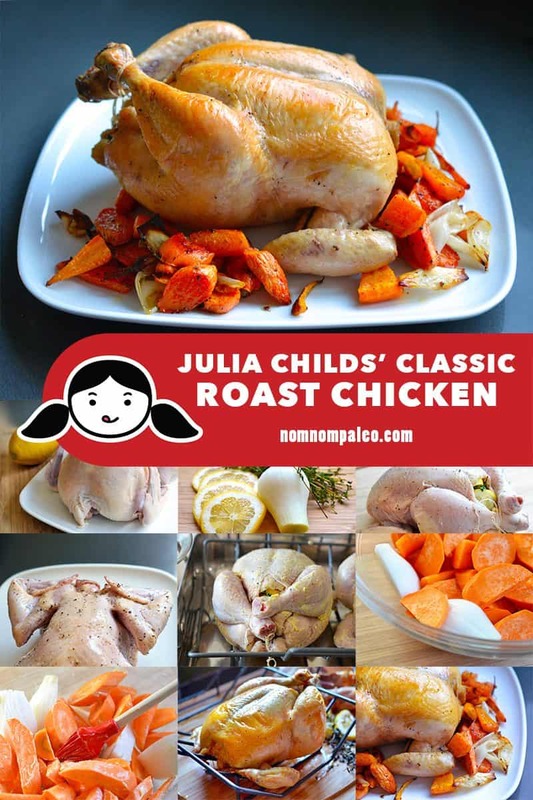 In celebration of Julia Child’s incredible culinary legacy, this week’s JC100 recipe is the classic roast chicken from Julia’s Kitchen Wisdom. 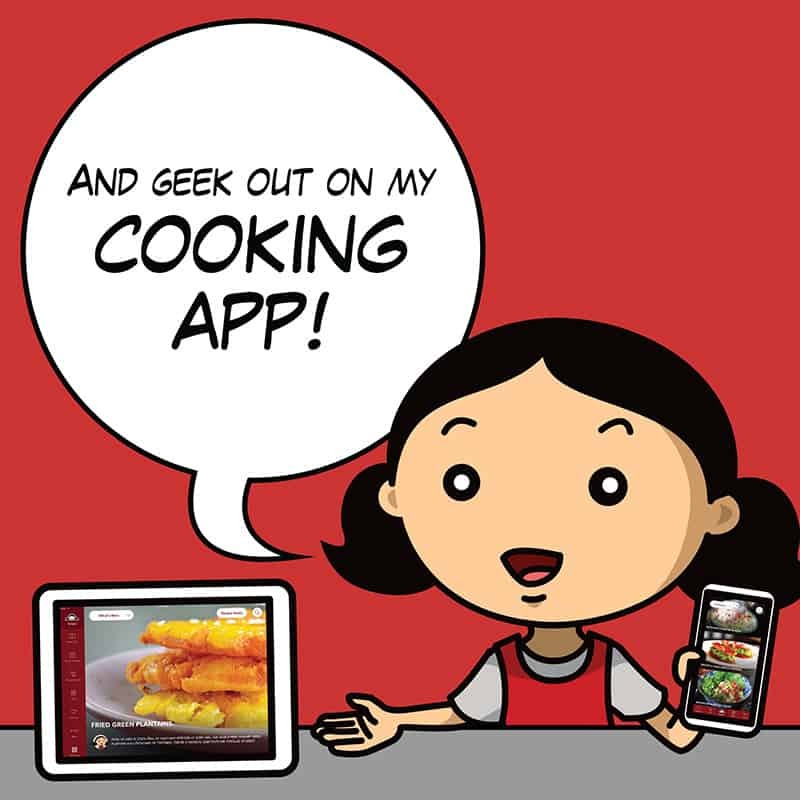 Her techniques and tips for roasting a bird are simple and straightforward, and produce a bird with crispy skin and juicy, succulent meat. 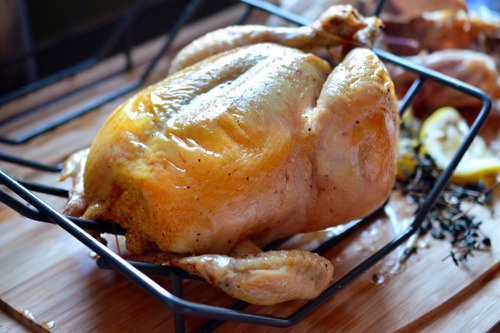 Even if–like me–you’re too lazy to baste as often as she recommends, the chicken will taste wonderful. Just make sure to follow this guide for cooking time: 45 minutes + 7 minutes per pound [e.g. 4-pound chicken = 45 + 7(4) = 73 minutes]. Also: Use LOTS of butter (or ghee to keep it Whole30-friendly). 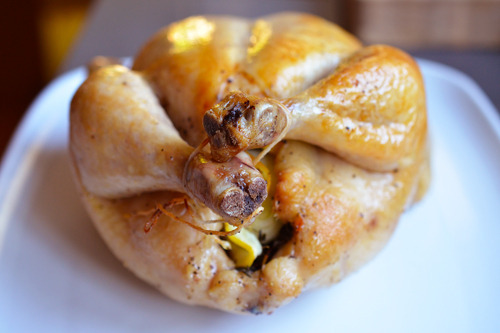 What I love best about this recipe is that you can double it and roast two chickens at the same time. That way, you’ll have plenty of leftovers and two carcasses with which to make bone broth. Winner, winner….oh, you know the rest. Round up two roast chickens and pat them dry. Liberally season the birds inside and out with salt and pepper. 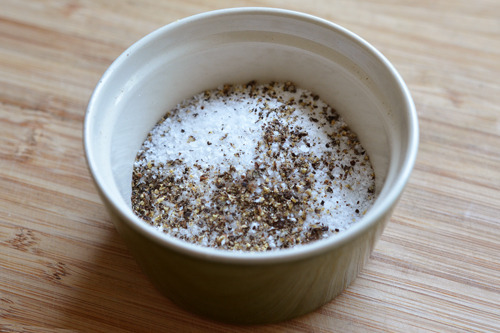 I like to salt my meat for at least a few hours and up to a day before I roast it to maximize the flavor-boosting potential. 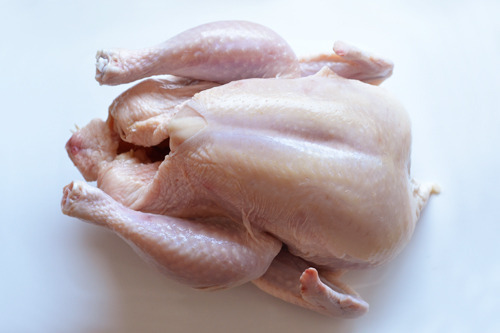 An hour before you’re ready to cook the chickens, take them out of the fridge to come to room temperature. At the same time, put your butter or ghee on the counter to soften, and preheat the oven to 425°F. 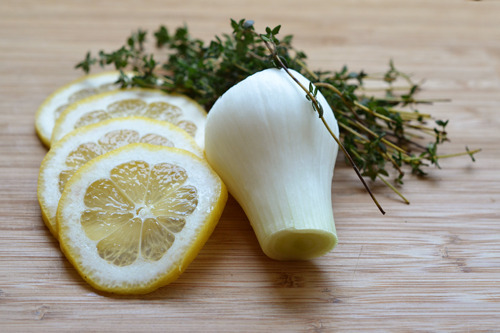 Once the chickens are no longer chilly, dry them off with a paper towel and stuff the cavities with lemon slices, onion, and thyme. 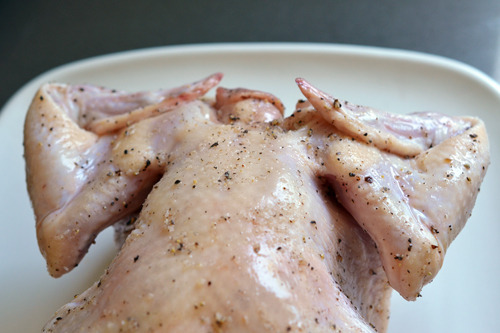 …and tuck the wingtips back behind the chicken. 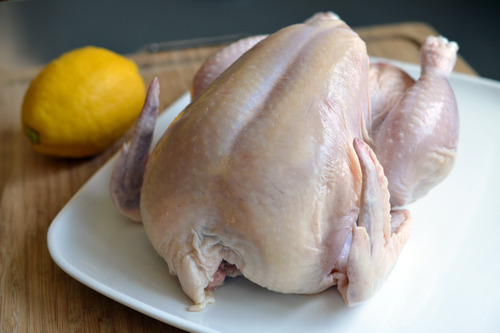 Use your fingers to massage the softened butter or ghee all over the skin, and lay the chickens breast-side up on the V-rack in a large roasting pan. 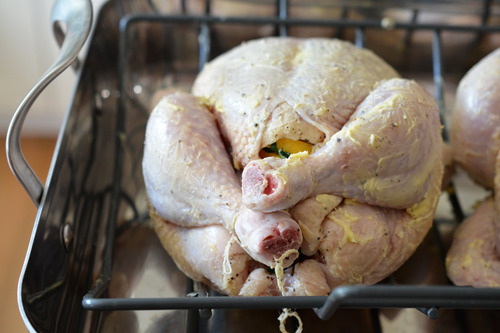 Place the chickens in the oven for 15 minutes to brown the skin. …with the remaining butter (or ghee) and salt and pepper. A half hour after the chicken first went in the oven, add the root vegetables to the pan and toss in the accumulated juices. Check the chicken for doneness about five minutes before the recommended weight-based cooking time (see formula above) is up. (I checked my pair of 4-pound chickens at the 70 minute mark.) Use an instant read thermometer to make sure the thighs reach 165-170° F.
Remove the rack from the roasting pan and let the chicken rest for 20 minutes prior to carving. Spoon on the root vegetables, carve up the birds, and dig in. 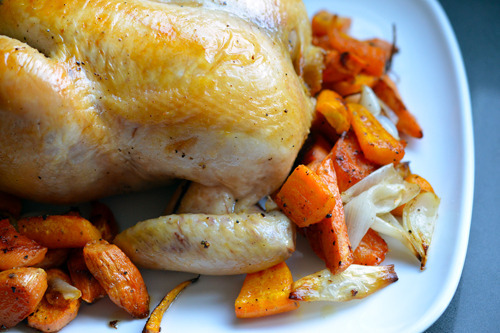 Got leftover roast chicken? Make my Madras Chicken Salad! Julia Child's classic roast chicken recipe is something you should have in your kitchen arsenal. 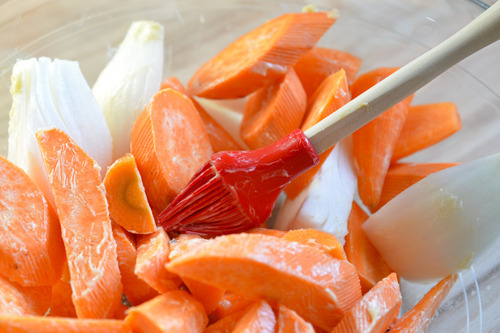 This simple Whole30-friendly recipe is great for leftovers! Round up two roast chickens and pat them dry. Liberally season the birds inside and out with salt and pepper. 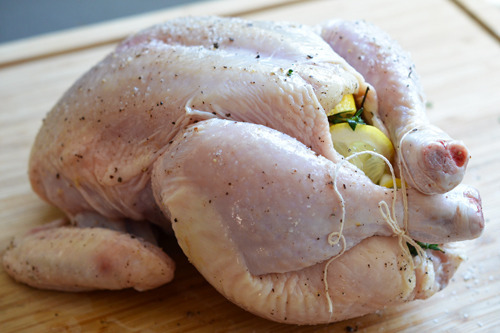 With a piece of string, tie the drumsticks together and tuck the wingtips back behind the chicken. 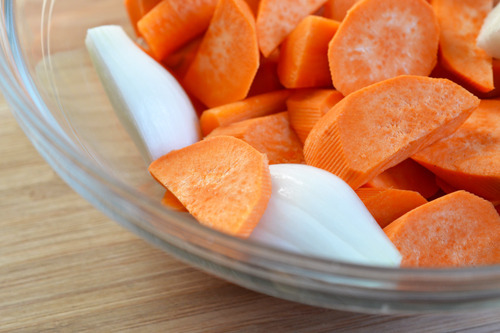 In a bowl, toss the carrots, yams, and chopped onions with the remaining butter (or ghee) and salt and pepper. Check the chicken for doneness about five minutes before the recommended weight-based cooking time (see formula above) is up. (I checked my pair of 4-pound chickens at the 70 minute mark.) Use an instant-read thermometer to make sure the thighs reach 165-170° F.
Use leftover roast chicken to make Madras Chicken Salad!